Bare with me for a moment if you please while I go on a little about weddings and the fabulous couples I come into contact with via LizzyB Loves. As you may know, I haven't had the pleasure of planning my own wedding yet, but I've been in love with paper ephemera all the years of my short (30 years) life, always creating my own stationery and gift-wrapping for holidays and birthdays, as well as Wedding Invitations for most everyone in my family and friends...so the love for Wedding Invitation paper goodies is all natural. Sure, I like creating beautiful layouts and dreaming up interesting and unique concepts for social stationery, but to get the pleasure of working with soon-to-be's with such vision for their Wedding Suite and passion for their roots (no pun intended, as you'll soon read) is just out of this world. A few days ago, Dallas, the groom, sent me an email praising my work and mentioning that he and his fiance would love to work together with me on creating their Wedding Invitations. But of course, I said, I just needed to ask a few questions regarding their vision and inspiration for the big day. Well, Dallas and Tracy were such sweethearts, they emailed me a complete rundown, sure, of what I had asked for in regards to color and venue choices, but they didn't stop there. They let me in on the history of their families, how they were born, and how their parent's love of nature and architectural elements which honor it, plays a role in their lives; this, in turn, gives way to the appreciation they have for the Arts & Crafts movement. Dallas and Tracy's only request was that through their Wedding Invitations we "...pay a bit of tribute to where [they] came from and what [their] parents have given [them] in terms of an aesthetic grounding while using [my] talents to craft a unique and dynamic look that would be distinctly [theirs]." Beautiful! And so it will be, Dallas. This short email conversation with the soon-to-be newlyweds filled me with such inspiration that I'm more than excited to get started on the concept design for the Wedding Invitations. 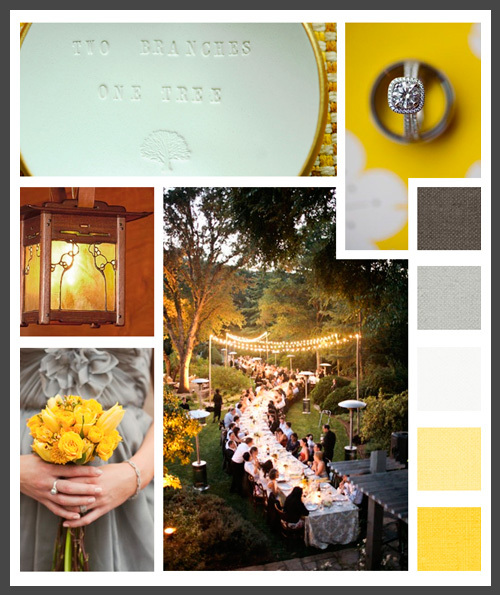 As I was gathering visual imagery to put together this Wedding color palette inspiration, I could imagine the final outcome of their vision combining their heritage and values all on a 5" x 7" piece of paper. You'll have to wait and see what I create, but for now enjoy this visual + sparkle = inspiration with the gorgeous architecture of the Gamble House in Pasadena, California. As you view it, imagine the couple's love of nature and Arts & Crafts architecture, as well as the beautiful outdoor venue which I envisioned would look something like this. Now, on to designing since I only have 10 days before going to print. Yikes! !